Browsing… through every blog and catching up with old pending posts does show that Most of them had a blast on the valentines .Award showering is another beautiful way of recognising each other . Never realised that I have made 101 lovely friends , who make sure to visit my blog and write such beautiful comments ! 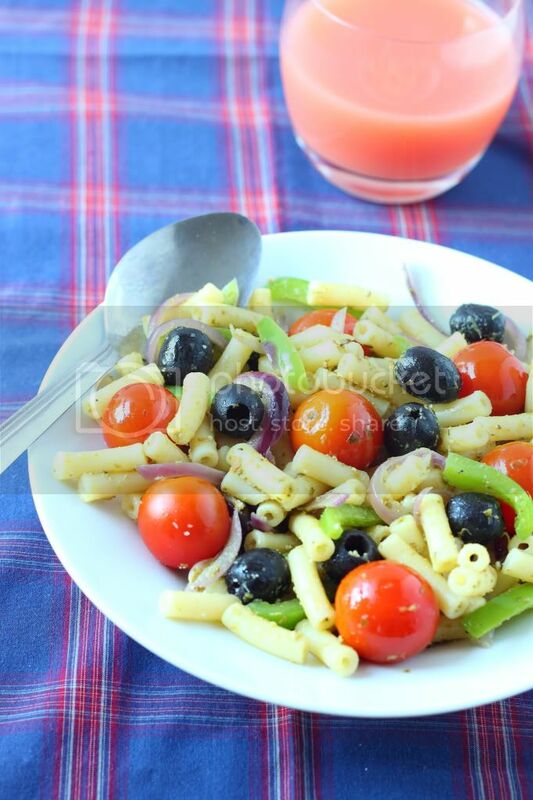 My lovely SIL – Gayathri living in atlanta shared this recipe of Pasta Salad with me and I made it for my party starter. Cook the pasta by adding sufficient water with few drops of olive oil and salt in a large pot. Once they are to the aldente consistency , drain the pasta in the vegetable colander and under running tap water. This will avoid the pasta to stick to each other. Chop the onions lengthwise and cut them into 2 . Similarly for the peppers. Saute onions,bell peppers, black olives for 3 minutes followed by cherry tomatoes for 1/2 a minute. Just ensure they remain crunchy.Turn off the gas…Stir in basil pesto sauce. In a big mixing bowl add cooked pasta, these vegs, parmesan powdered cheese , salt ,black pepper , italian seasoning and fresh basil .Mix them well and serve as a starter for adults and main course for kids. I haven’t used fresh basil out here.. instead used dried basil . Do not half the cherry tomatoes. Do not saute them too long too. This recipe comes right in time for Divya’s Show me your salad event. Perfect bowl of nutrition and perfect for the event. looks so lovely and nice click. dear….congrats on ur award! thats my favourite all time comfort meal. its so healthy and nutritious. love your way of making it…would try this sometime soon. congrats on your awards. 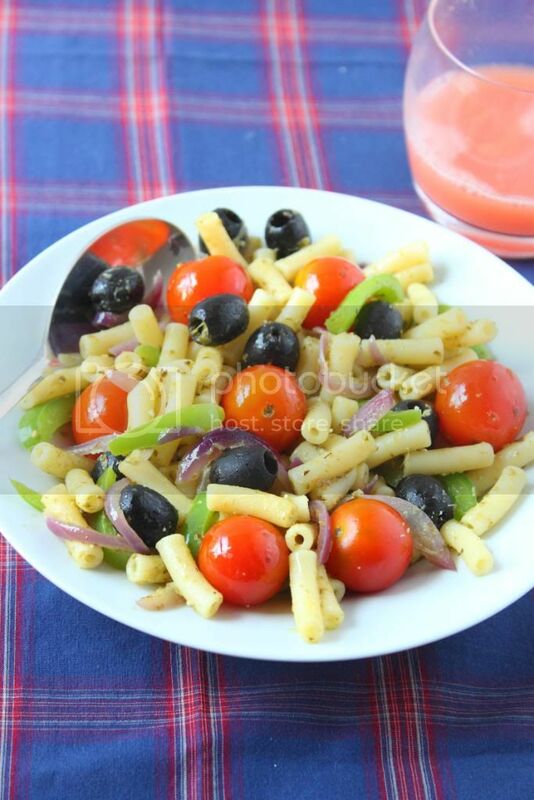 Pasta salad looks fabulous! looks delicious! Congraz on lovely award! Nice click..looks so yummy.Congrats on the award.. Fantastic and tempting pasta, congrats on ur awards Sandhya. Comforting salad bowl… Too many fresh colors means healthy for sure!!! Congrats on your award… Its always difficult to do the catching up after a long break :)!!! Pasta Salad looks delicious. Congrats on your awards. Perfect Salad and Great Click! Congrats on ur award & Thank you for sharing it with me…. Congrats on your awards dear ! Pasta looks perfect, infact more than a salad this seems a wholesome of meal. great pasta and really filling..congrats on your awards. Wow..what a beautiful bowl of pasta…hey congrats for your awards..
Lovely bowl of pasta salad…looks yumm. Hearty congratulations on ur award! Yummy and healthy salad, looks excellent too!!! Congrats on your awards Sandy ! wow wonderful salad in cute bowl… I can finish the whole bowl… so colorful and healthy. And congrats on ur award dear..